As the late Michael Jackson said, “This is it”, which was a prophetic statement in many ways! That being said, this is it. This is the review of the goal setting seminar. I hope you enjoyed the content, but more importantly, I hope you are applying it! My friend Gene is an expert in his field and currently works as a consultant with Tony Robbins and Chet Holmes. 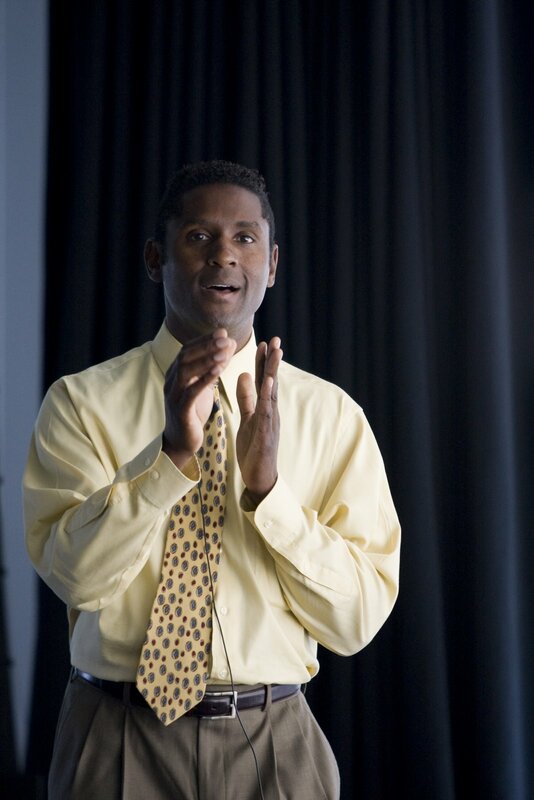 Gene teaches individuals how to use the art of persuasion as a sales tool. What does that mean? Every business deal, including “Job Interviewing” is a sales situation, an opportunity to sale yourself. Many of us don’t like to refer to ourselves as sales people, but we are! If you know anything about children, they are some of the best sales people ever! They are relentless and won’t take no for an answer. 1. Know what you want – decide where you want to go. o 95% of Americans don’t have written goals. o Reticular Activation System (RAS), part of brain that help convert images to reality. 2. Make sure you’re why is strong enough! o When we ask ourselves the right questions, we come up with the best “Why’s”. Why I should have my dream job. Why I need to find a job that I am passionate about? Why I need t o be fulfilled in my career? 3. Take Action – Action is the key! o The law of attraction is an amazing thing – it got a lot of attention in the early 2000’s. o The biggest thing many people didn’t do was “TAKE ACTION”. It’s one thing to imagine what you want, however, there are physical laws in our universe that require action. o Action equals motion, motion equals results! 4. People are rewarded in public for the things they practice the most in private. o The best in the world do the hard things behind the scenes so that when they show up they are on! o What are you doing in private for your career or job search? o Are you doing the things the unsuccessful people don’t do? o Are you doing the necessary work – be on the look out, your success may be wearing overalls! 5. You have to Constantly MEASURE YOUR RESULTS! o Find someone that has achieved the outcome you want to achieve. o Buy someone a cup of coffee or lunch and interview them on “How they do what they do”. o Successful people apply the right information in the right order. There you have it! This formula is GUARANTEED to create success if you use it. As Gene said, you MUST put the information to use – you must take ACTION in order for the information to pay dividends. It’s that simple. Now, I’d like to challenge you to use this information in your life over the next week. Create a plan of action and let me know how you are progressing! We are in the home stretch of the final inning! Again, 95% of America does not do this exercise each year, which means that we are flying in an airplane with no map…. Would you want to do that in real life? Got news for you – this is real life! •	You have to Constantly MEASURE YOUR RESULTS! Gene suggested that as you take action you have to have check points. You must have a way to measure your results. In my 3 month plan – I’m off to a fast start, however, as life happens I’ve had to step back and reassess my annual outcome several times to ensure that I’m on track for what I want. I’ve had to review my musts and wants. Goal setting works if you use it right and are HONEST with YOURSELF. Its not enough to write goals without looking at them and measuring your results. The easiest way to do this is to have an annual goal that you review at least twice per year. But, a set of smaller goals in your overall plan that you assess monthly. This is why I’ve decided to use the quarterly system for measuring my results – don’t get me wrong, I measure weekly and daily on some of my outcomes, but we must give ourselves a chance to try things before we change them! • If you’d like to do any of the programs for free – ask your college to purchase a bulk membership to give its students and alumnus. After all, you paid a lot for your education – right! I can tell by the responses that people are following this series, which is AWESOME! The question I have for you is – Are You APPLYING this information? I’m going to imagine that you are, so let’s get right into it! o	Definition of decision in the Online Dictionary. Latin dēcīsiō, literally: a cutting off. So the literal idea to this is that you DECIDE what you want and cut off any other possibility from deterring you! •	Make sure you’re why is strong enough! o	When we ask ourselves the right questions, we come up with the best “Why’s”. Why I should have my dream job. Why I need to find a job that I am passionate about? Why I need t o be fulfilled in my career? •	Take Action – Action is the key! o	The law of attraction is an amazing thing – it got a lot of attention in the early 2000’s. The biggest thing many people didn’t do was “TAKE ACTION”. It’s one thing to imagine what you want, however, there are physical laws in our universe that require action. o	Action equals motion, motion equals results! • I’ve decided that I am going to focus on a quarterly action plan – while I have an annual vision, my focus in being broken down into quarters. This helps me to keep from overwhelming myself. •	While I have a very narrow set of business focuses this year, I must ask myself the right questions. o	Why must I do this? Why should I do this, What am I doing this? •	Taking Action is the biggest thing that every successful person knows is the building block to every great idea. There in not one great idea in existence today that didn’t have a mass of action behind it. It’s not enough to simply imagine what you want – although that is the first step. However, you MUST take action to set things in motion and the universe will open pathways. Keep on coming back, there’s a lot more to give! •	Please post a note to let me know what you think about the information and how you are using it. •	If you’d like to do any of the programs for free – ask your college to purchase a bulk membership to give it’s students and alumnus. After all, you paid a lot for your education – right! Welcome back! I’m certain that you are enjoying and APPLYING this information right away – it’s the best way to achieve results and to get the things you want out of life. Again, if you follow me over the next few weeks I guarantee that you will experience a shift in your job search, career, and your life. •	Know what you want – decide where you want to go. o	95% of Americans don’t have written goals. o	Reticular Activation System (RAS), part of brain that help convert images to reality. •	I started by reviewing my wants – which included a review of what I wanted last year to see if anything transferred over to this year. i.e. health/fitness, relationship, family, business/career, etc. These are continually in my focus so I always bring elements of them forward – but also delete aspects of them based on my progress, growth or change of direction. • I’ve written down in detail what more I’d like to accomplish this year, which leads toward my “Outcome”. Remember, goals are milestones that lead to “Outcomes”. So when goal setting, always start with the question, “What is my outcome” i.e. to have a successful online e-learning university where I can share ideas with people that help them find their dream jobs. One way I keep track of this is by using a white board in my office so that I can interact with ideas on a regular basis. Many people write goals and don’t look at them again – you must be in touch with your ideas – they will serve you. More on this later. • I have a number of images that support my vision. In day 1 of our Career Mastery course, there is a chapter entitled, The Secrete of a Compelling Vision”. A vision is like a final destination, where are you going? What do you need to do to get there? I have a vision board that has been morphing over the past years and have updated mine this year. Also, my desktop computer is where I have a screen saver of my new visions playing. I recently gave an electronic picture frame as a gift to a friend that had images of his dreams on it – I call it an electronic vision board. Another simple thing you can do is surround your home with images, i.e. photos, magazines, art, clippings, etc. with images that support your vision. Here’s an important thing to know about this part of the process – the brain doesn’t know the difference between a vivid dream and this state we call reality. Thus, as I say in my Leveraging Linkedin course, “If you can say it, and see it, you can do it!”. Ok – I hope that has given you another layer of clarity as to how you can apply this information to your job/career search , which is your life. Please post a blog to let me know what you think about the information and how you are using it. If you’d like to do any of the programs for free – ask your college to purchase a bulk membership to give it’s students and alumnus. After all, you paid a lot for your education – right!